Connecting a computer running Windows 10 to a network isn’t very difficult, but you do need to make sure that your machine is properly connected and that your Homegroup is set up. Click the Start button and choose Settings from the Start menu. 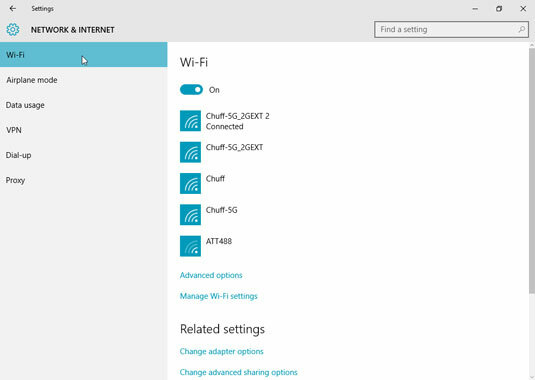 When the Settings screen appears, click the Network & Internet icon. The Network & Internet settings page, shown here, places the strongest available wireless networks at the top of the list. Windows sorts the available wireless networks, usually placing the one with the strongest at the top. If your router has a little button labelled WPS (Wi-Fi Protected Setup), you can press it at this point. The router then slips the password to your PC through the airwaves, sparing you from having to type it in. At this step, Windows 10 offers to let you share a wireless network’s password with all of your contacts. To do so, click the adjacent Share Network with My Contacts check box. This works fine for public networks, and for people with trustworthy friends. But if your contacts include some amusing but shady characters, don’t check this box when connecting to your home network. From the Windows desktop, the taskbar’s wireless network icon (shown in the margin) provides a handy way to connect wirelessly, as well. If your desktop’s taskbar contains a wireless network icon, click it to jump to Step 3.